Nuclear Cardiology Board Prep On Demand. 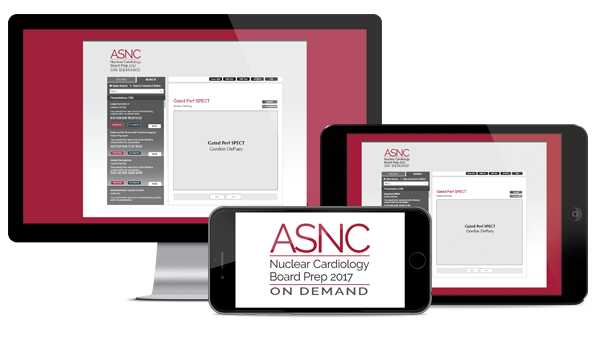 Nuclear Cardiology Board Prep On Demand technology makes it easy for you to access your content anytime, anywhere. Slides with synchronized audio — it’s like being at the live course. Earn up to 19 AMA PRA Category 1 Credits™1. Watch a session and then click on the CME Test button. Earning credits is easy, fast and convenient. PDFs of presentations can be downloaded onto your computer for easier note taking. MP3 audio files can be loaded onto your favorite MP3 player, so you can listen to sessions while on-the-go. Pay $1,399 and Receive a $500 Gift Card of Your Choice! Accreditation Statement: The American Society of Nuclear Cardiology is accredited by the Acrreditation Council for Continuing Medical Education to provide continuing medical education for physicians. Designation Statement: The American Society of Nuclear Cardiology designates this enduring material for a maximum of 19 AMA PRA Category 1 Credits™. Physicians should claim only the credit commensurate with the extent of their participation in the activity. Refund Policy: Refunds will be permitted within 30 days of receiving online or digital access to your product. The following conditions apply: If CME credit is available and has been claimed, a refund will not be permitted. For products with that include physical CD's, thumb drives or hard drives, these items must be returned to Learner's Digest before a refund can be processed. Tax Benefits: The entire cost of your purchase may be tax-deductible when used for professional purposes. Please consult your tax advisor.